The Payload Module (PLM) is under the responsibility of Airbus (Defence and Space). 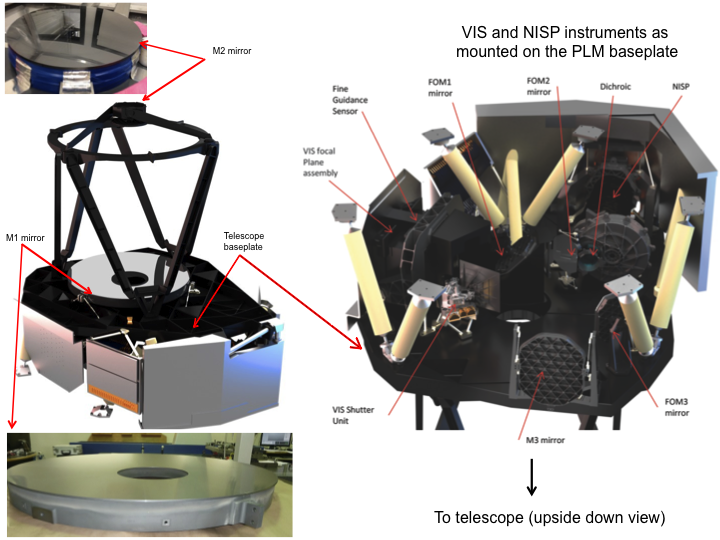 It comprises the telescope, the PLM thermal control system, the Fine Guidance Sensor (FGS), the VIS and NISP instruments (delivered to Airbus Defence and Space division by the Euclid Consortium) and the detectors (delivered by ESA). The VIS and NISP are described in the next sections. 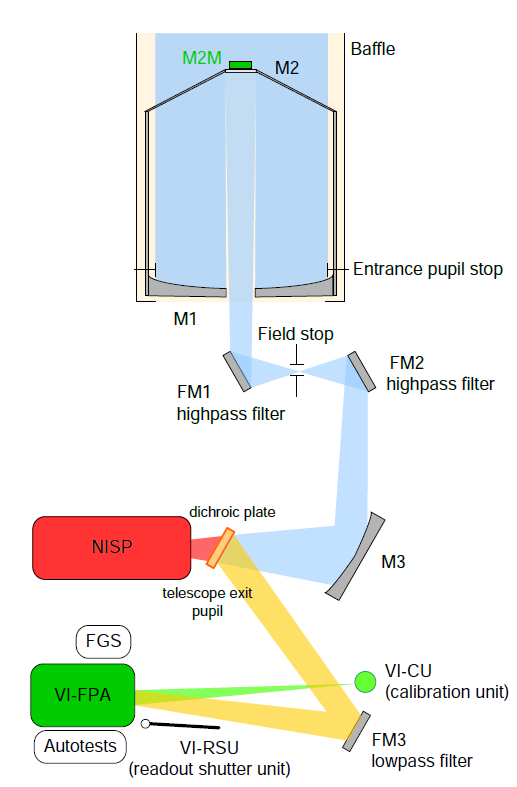 This section focuses on the telescope and the optics (folding mirrors, dichroic beamsplitter plate) that feed the instrument. An overview of the PLM elements is shown on the figure below. The telescope is a 1.2 m on axis 3-mirror Korsch cold telescope providing a field of view of 1.25 x 0.727 deg2. M1 is maintained at temperature below 130K with thermal stability better than 50mK. The mirrors and structures are all made in Silicon Carbide, a material with excellent thermo-elasticity and stifness and immune to radiations. The telescope design comprises a 3 degree-of-freedom mechanism for M2 focus and tilt correction that allows Airbus Defence and Space division to meet all requirements on the image quality for weak lensing science (ellipticity, FWHM, R2 and encircled energy) . Overview of the PLM sub-systems – Courtesy Airbus Defence and Space.